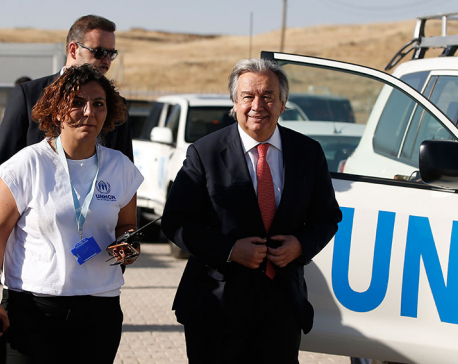 KATHMANDU, June 22: United Nations Secretary-General Ban Ki-moon on Tuesday condemned the suicide bombing in Afghanistan's capital on Monday that killed 12 Nepalis en route to the Canadian Embassy, where they had been working as security guards. In a press statement issued by his spokesperson, Ban has also extended his condolences to the families of the victims and to the governments of Nepal and Afghanistan. In the statement, Ban has also called for those responsible for the attack to be brought to justice. Meanwhile, India has urged the UN Security Council to look into the deteriorating security situation in Afghanistan and to designate new Afghan Taliban leader Mawlawi Haibatullah Akhundzada a terrorist individual. Presenting India's statement at the UN Security Council debate on UN Assistance Mission in Afghanistan, India's permanent Representative at the UN, Syed Akbaruddin, said groups and individuals that perpetrate violence against the people and the Government of Afghanistan cannot have safe havens and should not be allowed to exercise control and wield influence over any part of Afghanistan's territory. "It is a sheer folly that the leader of a proscribed entity is not yet designated as a terrorist individual," stated the Indian ambassador Akbaruddin. Akbaruddin also offered condolences over the loss of lives in the bomb attack in Kabul on Monday, in which around 20 people, including 12 from Nepal and two from India, lost their lives. Earlier in May, US State Department deputy spokesman Mark Toner had said that the new Taliban leader Mawlawi Haibatullah was not on the US list of designated terrorists.